Based in Byron Bay, Getaway Girls are all about health, fitness, and relaxation. The perfect combination for me and a big plus it was based on one of the most beautiful coastal towns in Australia. 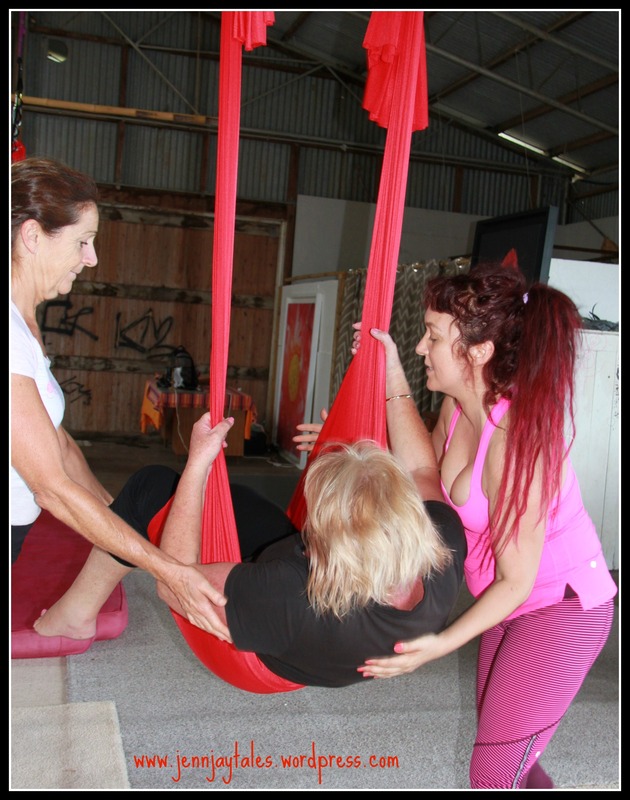 Antigravity yoga is designed to increase health and physical agility, while having fun. 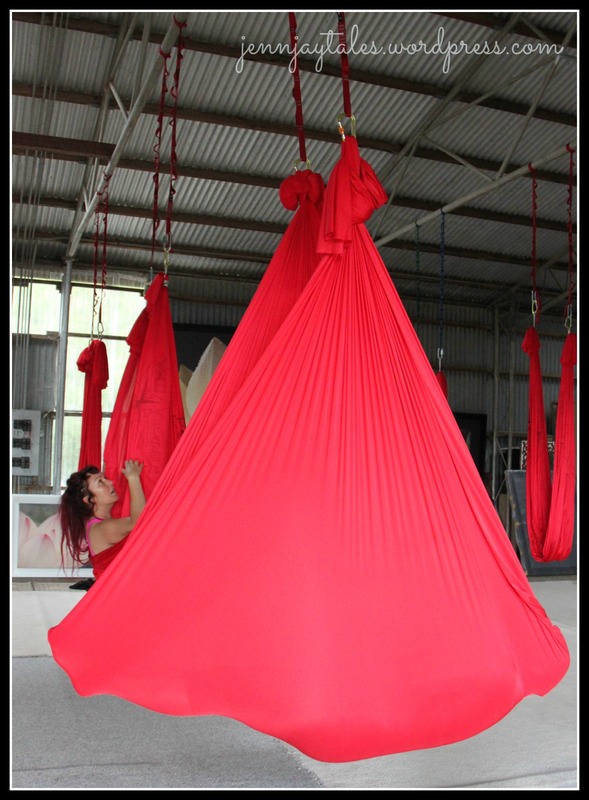 Key to Antigravity yoga is the antigravity hammock, made from a soft, stretchy, silky fabric connected to the ceiling or overhead beam. The fabric provides a soft support. Advocates suggest this style of exercise provides relief to any compressed joints and helps with re-aligning the body. We line up in front of individual red hammocks, unsure of what to do next. “For today I will show you some basic uses of the hammock, nothing too complicated,” says Arianne. There was a collective sigh of relief. Arianne gently coaches the Getaway Girls through the first moves. 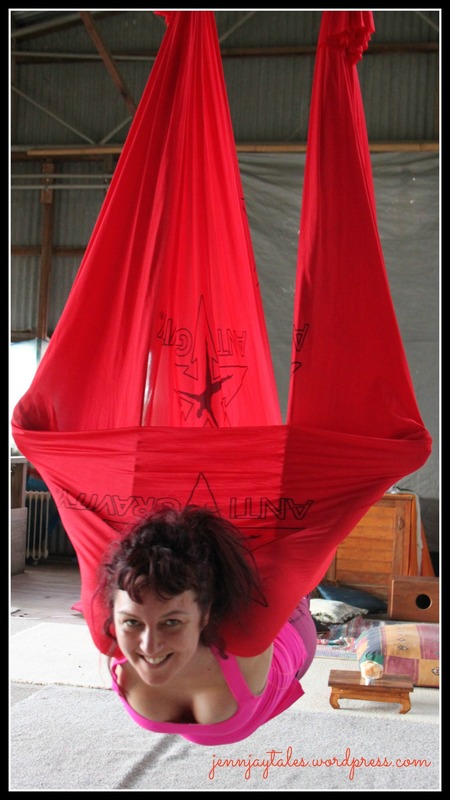 Initially it feels strange and a little awkward using the fabric as a soft trapeze to support your limbs. After a few attempts, (accompanied by plenty of giggles and a few curses) under Arianne’s expert and patient guidance, we master simple inversions. Our confidence grows and we try more complicated poses. It becomes less daunting and is actually fun. At varying times we alternate using the hammock like a swing, then a trapeze. When was the last time you found yourself suspended upside down? wish i could show me hanging upside down but someone had to take the photos! My head felt heavy but following a few spins, twists and stretches effectively supported by the soft silk I gave in to the sheer bliss of floating with a gentle body stretch. One of our Getaway Girls, Megan had a lamindectomy (back surgery) some years ago. She was understandably hesitant about getting her feet off the ground. With gentle encouragement from Arianne and our group support, Megan overcame her fear. 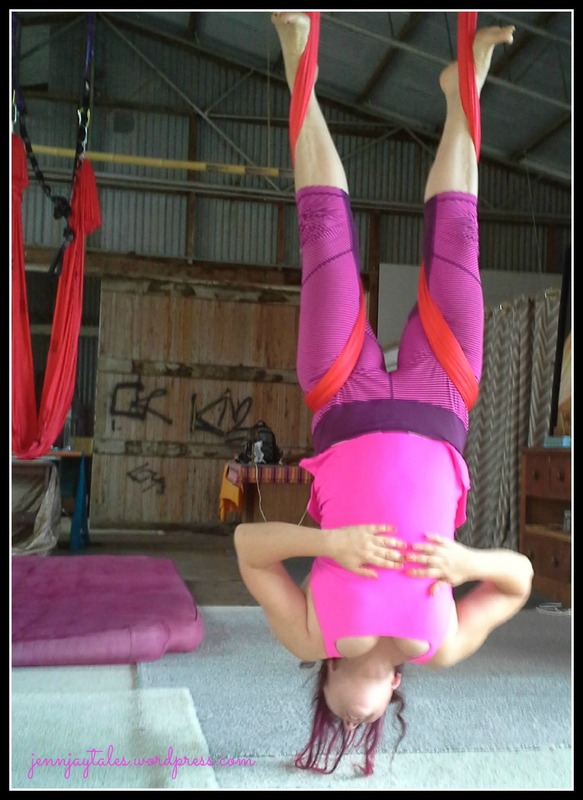 By conquering her fears and trusting her teacher Megan experienced something she never thought she would do again – hang upside down. Megan receives some gentle encouragement from Kaylene and Arianne. The class was over. I didn’t want to leave my silk cocoon. Cocooned in soft silk – drifting off to sleep. We felt an incredible sense of achievement. The sensation of floating is fun and relaxing at the same time. This is something we should all try. But be prepared to step outside of your yoga comfort zone. what we can work up to! Categories: Feature Style Stories, Travel Stories, Why have me write for you? 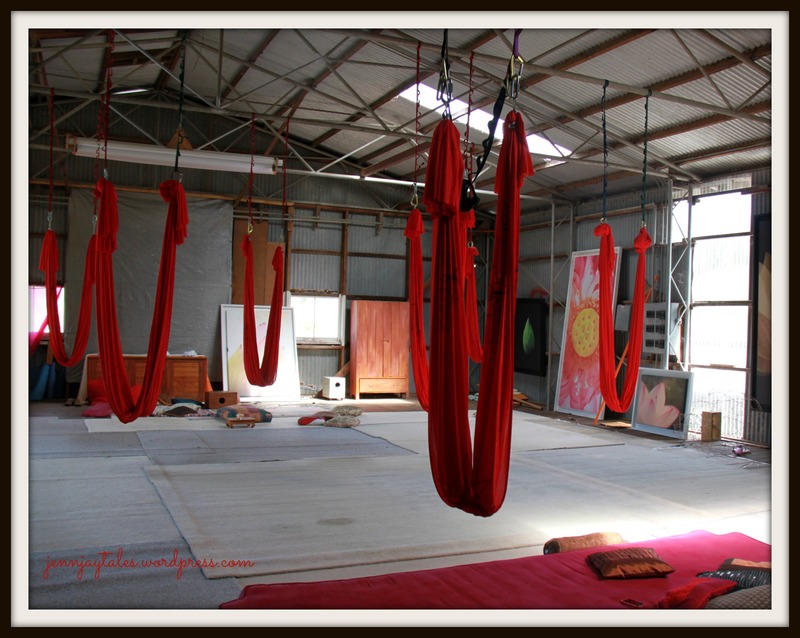 | Tags: #aerialyoga, #antigravityyoga, #ArianneSchreiber, #getawaygirls, aerial yoga, antigravity yoga, Byron Bay, female fitness groups, Getaway Girls, The Shed, travel, Week-end getaways close to Brisbane, yoga in Byron Bay | Permalink.